Much of Evie Wyld's fiction has an unmistakeable feeling of menace as if there is something dangerous lurking unseen in the background just out of sight. This is felt most intensely in her novel “All the Birds, Singing” where someone or something unknown is savagely killing the sheep on a woman’s farm. In this graphic memoir she writes of her family life, growing up in Australia and her enduring fascination with sharks. Using stark pared-down language Wyld creates a mood where reality intersects with mounting feelings of fear, particularly a fear of death. However, sharks are not the monster enemy. They are gradually shown to be more the victims – killed by humans out of fear. They are a presence in the girl's imagination as comforting in their constant attendance as they are horrifying. The exquisite, expressive and haunting drawings imaginatively bring the story to life. Humans are cartoonish figures while images of the sharks or other sea inhabitants are drawn in a hyper-realistic way. “Everything is Teeth” refers to the surface of a shark's skin which can be like sandpaper so swimmers who simply rub up against a shark feel their skin being cut as if by teeth. The title is given an even more layered complex meaning as the story progresses. When the girl eventually re-enters the water after receiving a jellyfish wound “The salt chews on my stings.” There is a sharp distinction created between the areas of habitation above the water and below. When this line is crossed it can result in injury or death. The savage way in which humans are shown to survive or fight against the threat we face when crossing this boundary between land and sea indicates how we are hampered by fear. This is echoed in relationships between the family members and the girl’s vivid imagination about how they might die. There are important messages here about learning to live with fear as well as maintaining respect for animals and each other. The atmosphere created by the drawings and poignant text is utterly enthralling. There's an extraordinary drawing of her brother swimming where the water is swirling and the current looks like a mixture of eyes and faces. Oftentimes sharks linger in the background even when she’s on land as if they constantly circle the girl wherever she goes. While snuggled up on the sofa reading this book I felt my toes curl. I was reminded of a great short story in Jackie Kay’s collection “Why Don’t You Stop Talking” called ‘Shark! Shark!’ where a man nearing retirement has a growing fear of sharks despite living inland. Sharks make an easy metaphor for our fear of death, but the co-authors of this graphic memoir transform this into something more subtle and complex. This is a quick read, but it will linger with you. 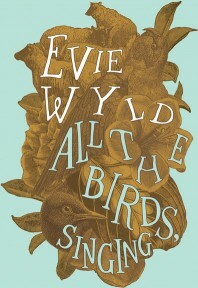 I read Evie Wyld’s first brutal and poetic novel “After the Fire, A Still Small Voice” with my book club some time ago. She has such a distinct powerful voice that I was thrilled to see she published a second novel last summer. I don’t know why it’s taken me so long to get to it, but I’m so glad I finally did. Since I started the novel on Saturday morning I’ve had a hard time putting it down. “All the Birds, Singing” is tremendous. Opening with the death of a sheep and a strange reclusive woman named Jake on her farm located on an English island, the book layers on several mysteries which become more and more intriguing as the novel progresses. The book is split into two parts. On one side we read about Jake’s experience on her sheep farm trying to discover who or what is killing her sheep, the indifferent hostility of her local police and her friendship with a mysterious man named Lloyd who appears on her property. In alternate chapters that move back in time we read about Jake’s past in Australia, why she ends up sexually entangled with a grimy old farmer named Don and the reason she fled her home. This shifting back and forth between locations and periods of time soon feels quite natural and adds a rapidly accelerating force to the narrative as Jake’s past is gradually revealed. Wyld describes the moment to moment thought process of her narrator with deft assurance making the story feel both engaging and thoroughly real. Jake is a physically and mentally strong woman who keeps her distance from other people, but finds she can't completely remove herself from society or the dangers of the world. Equally the author captures the social awkwardness in her interactions with the other characters so that small gestures indicate a lot about what is being left unsaid. The author has a way of describing Jake’s smile so that you can tell she’s grinning as a front to hide her true thoughts/feelings because she believes this is what people want. It’s something she’s learned in order to survive and navigate tricky situations where she might be vulnerable. In actuality, her smile probably registers as a false grimace which is only there to conceal and pretend. Although the book is told from Jake's point of view the reader is often aware of both her internal thoughts and the external opinions of those around her. Animals play an important role in the narrative. The book is a thorough lesson in sheep shearing. But also, the countryside is awash with wild animals lurking around every corner from English foxes to explosive nests of spiders to more exotic Australian animals like goanna, pademelon and galah. The environment is so rich in animal life that it begins to feel that the world is sinister and wild with everyone taking on a role as either the hunter or hunted. They become an intrinsic part of Jake’s psychology as demonstrated here: “A fox was being made love to somewhere in the woods and her shrieks cut straight into my room.” What's particularly striking about this quote is the way Wyld introduces the romantic notion of “made love” and immediately after adds a sinister edge with “her shrieks.” Some animals stand out as distinct characters in themselves. A dog named Kelly is described with such precision and engaging with Jake in such a dynamic way that she becomes an important character herself. “All the Birds, Singing” is a beautifully written book about harsh difficult subjects. Small details which seem insignificant early on in the narrative take on a deeper emotional meaning as the story progresses and we learn more about Jake’s past. This is skilful, inventive storytelling. Jake is a surprising vibrant female character unlike any other I've read in fiction. The ending is a real shocker, deeply moving and gives enough room for ambiguous interpretations. It's left me wondering.